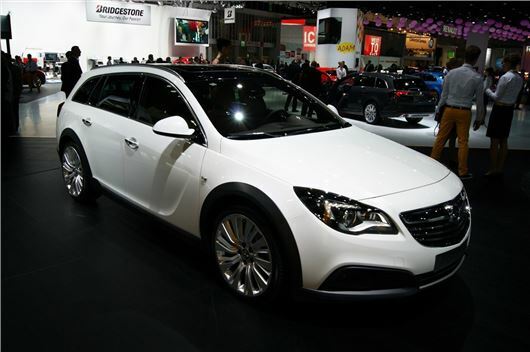 Vauxhall has taken the wraps off the Insignia Country Tourer at Frankfurt. It blends the estate body of the Sports Tourer with chunkier styling and off-road touches like a higher ride height, improved ground clearance and all-wheel drive. Prices have not been confirmed but should be around £30,000 when sales start towards the end of 2013. Externally the Country Tourer sports black plastic trims around the wheel arches, along the sills and on the front and rear bumpers, along with a metallic protective panel protruding from under the engine and at the rear of the car. There are also LED brake and tail lights and LED day time running lights, plus 20mm more ground clearance over the regular Insignia estate. Two engines are offered – a 2.0-litre CDTi diesel with 165PS and 380Nm of torque and a 2.0-litre BiTurbo CDTi with 195PS and 400Nm of torque, the latter of which is only offered with an automatic gearbox. Regardless of engine choice the Country Tourer has all-wheel drive, though it reverts to front wheel drive unless traction is required at the rear – such as in adverse weather.